Get juicy with out brand new XXL trap pack! ‘Astro Juice – Juicy Trap & Vocals’ is a massive library, perfect for those who enjoy chart-topping trap music in the likes of Travis Scott, Juice WRLD, The Weeknd, Lil Peep, Lil Skies & more. This enormous XXL pack covers over 2.3 GB of content and provides 18 full vocal acapellas in both dry and wet versions. Fusing the best hot trendy vocals with popular modern melodies and tight & boomy drums and loops, this pack will make a great addition to your Trap & Hip-Hop collection! Get ready for a huge array covering 18 (!!!) fully stemmed out acapellas! We took to the studio and recorded full phrases, ad-libs, layers and harmonies with the best lyricists around – to warp, modify and twist up to your flavor. Expect clean vocal hooks, distant atmospheric vox, massively chopped and pitched FX vocals or pop-polished autotune phrases. This collection has it all and has enough material for you to make dozens of songs with. We ensured to deliver the most variable collection of low kick booms. Covering subtle, warm 808’s or 808’s with heavy bottom-frequencies, we captured the complete range of this important element. Make your studio shake like never before! This breathtaking collection includes a variety of powerful kicks, crisp claps, bright hi-hats, authentic percussions, dusty shakers, shimmering crashes, dazzling top loops and more. Take your drums to new heights with this extraordinary extension of electronic drum hits and percussions. ‘Astro Juice – Juicy Trap & Vocals’ contains a colossal collection of various instruments and sounds. Explore the profound selection of distant atmospheres and pads, innovative arpeggios and plucks, wicked bell melodies, original synths & many more. Discover the unconventional future-style melodies that embody this amazing pack. Each sound is awaiting to be the key component of your new creation! These riffs are hot son! 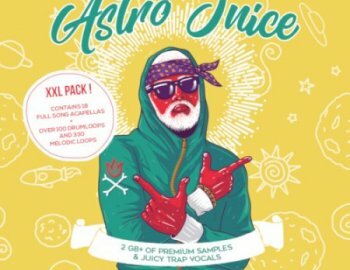 Grab ‘Astro Juice – Juicy Trap & Vocals’ NOW!